Peggy Jean Schroder took aim at her sports career at the age of 12 when her brother won a bow and arrow set. After “liberating” it from him, it was hard to keep her in the house. Archery became a way of life, culminating in the winning of two national intermediate field archery championships and numerous club, city, state and regional championships. Archery was the jumping off point that led Peggy into a career of teaching high school physical education and coaching many different sports. She also coached the Pima Community College softball team for five years during which time the team won runners-up honors in the region, won the 1980 regional championship and placed second in the National J.C. Championships. 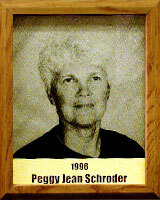 Peggy was very active in the Arizona Interscholastic Association and statewide officiating. She has officiated volleyball, softball, basketball and gymnastics at all levels. She ended her officiating career as a Pac-10 official. She also was the first area co-commissioner for girl’s sports with the AIA. Peggy has officiated hundreds of competitions including conference, regional, divisional and state championship tournaments. Peggy was an administrator in TUSD for 29 years. All of her degrees are from the University of Arizona, including a B.S. (physical education), M. Ed. (special education) and an administrative certificate. In 1965, Peggy was recognized as the Outstanding Sportswoman at the UA.